Panama Booms While Poor Watch From Afar A major expansion of the Panama Canal is fueling the tiny Central American country's economy. 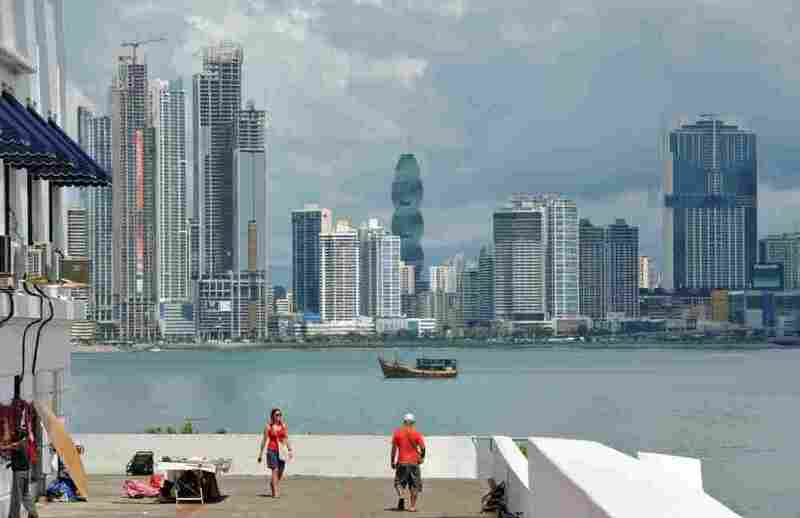 Last year, Panama's economy grew by more than 10 percent. But with roughly one-third of the country's people living in poverty, critics say the growth is primarily benefiting a small elite. Tourists visit the San Felipe neighborhood in Panama City in December 2011. Panama is experiencing record economic growth, but many fear the benefits aren't trickling down to the poor. The Central American nation of Panama is booming. Fueled by a multibillion-dollar expansion of the Panama Canal, a thriving banking industry and capital flight from Venezuela, the tiny nation has the highest economic growth rate in the hemisphere. But even as the government builds a subway system and markets the country as a tropical paradise for multinational corporations, not everyone is sharing in the prosperity. We still have two countries — a First World country that's going gangbusters, and a half an hour away, a Fourth World country with too many poor people. These days, Panama City is a giant construction site. Roads are being torn up. Excavators are digging out tunnels while cranes above put the finishing touches on new high-rise condominiums, office towers, banks and hotels. On the south side of the Panama Canal, just across the Bridge of the Americas, a former U.S. military base is being converted into a mixed-use residential, corporate and industrial park called Panama Pacifico. "We have already built close to 100,000 square meters' worth of warehouses and we're building another 50,000 square meters that should be done by the end of the year," says Juan McKay of London & Regional, the master developer of the project. McKay's company is transforming what used to be the U.S. Howard Air Force Base into a sprawling campus with corporate offices, manufacturing and logistics facilities. Dell Computer has already set up a call center on the campus. On a recent day, McKay stands where the heavy equipment giant Caterpillar is building a new regional hub. "Caterpillar is obviously looking for a strategic position in Latin America that will make them very easy to go anywhere," McKay says. A Boom, But For Whom? McKay and others are touting Panama as the place to do business in Latin America right now. It has five major shipping ports clustered at either end of the canal. The country has a sophisticated banking sector. Also, there isn't the drug violence that's been plaguing Mexico and Central America. Last year, according to the government's statistic agency, economic growth in Panama hit 10.5 percent, indicating that this country of 3.5 million people is expanding faster than China. But the boom isn't benefiting everyone. As shiny Porsches and chrome-tinted Hummers race along the new coastal boulevard, roughly one-third of Panamanians still live in poverty. "From my perspective, the major challenge Panama has is the economic and social polarization," says Roberto Eisenmann, founder of the Panama City daily newspaper La Prensa. "We still have two countries — a First World country that's going gangbusters, and a half an hour away, a Fourth World country with too many poor people," Eisenmann says. Panama is also a young democracy that's still struggling to emerge from the dictatorship of Manuel Noriega in the 1980s. The current president, Ricardo Martinelli, won the 2009 elections by a landslide. But following a series of corruption scandals, his popularity has plummeted. Miguel Antonio Bernal, a constitutional law professor at the University of Panama, says Martinelli's authoritarian administration is running roughshod over the rule of law to attract more foreign investment while ignoring the needs of ordinary Panamanians. 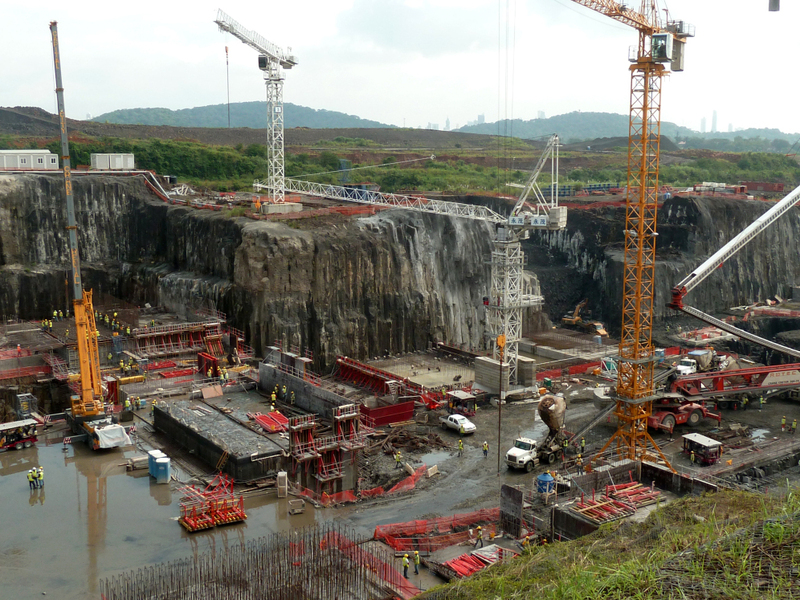 This photo from Dec. 21, 2011, shows construction of new locks on the Panama Canal, in Cocoli, Panama. "At any time we are going to have a social explosion that will be very dangerous. Not only for us, the Panamanian people, but also for the economic interests and investments that are already in the country," Bernal says. On a recent night, a new boutique hotel in the hip, historic Casco Viejo area of Panama City is holding its opening. At the door, a bouncer checks people's names against a guest list on an iPad. Disco lights flash across the four-story atrium. At the bar, young women laugh; the rooftop deck looks out on the cobblestone streets below. The Spanish founded Casco Viejo in 1673, after pirates sacked an earlier settlement farther up the coast, nearly destroying it totally. Standing on the seawall of the old city, Patrizia Pinzon, a local real estate agent and activist with the Casco Viejo Neighborhood Association, says this area now faces threats from development. The Martinelli administration proposes building an elevated freeway in the harbor. "It would be six lines of highway on the water, around the historic district, that would connect with the other side of Panama City, the area where all the high-rises are right now," Pinzon says. Pinzon says a freeway just offshore, encircling Casco Viejo, would destroy the historic character of the neighborhood and put its designation as a UNESCO World Heritage site in jeopardy. In the 22 years since the U.S. deposed Noriega, governmental institutions and civic groups have been gaining strength slowly but steadily in Panama. The recent boom, however, and the election of the pro-growth Martinelli, Pinzon says, have changed things. "With this administration, it seems like we are just going back [in time]," Pinzon says, referring to when the government catered only to the demands of the wealthy and powerful. After her anger cools over talking about the proposed highway on the water, Pinzon is more philosophical about Panama's growing pains. Smiling as if she's describing a favorite niece, she says Panama right now is like a beautiful 15-year-old girl who's pretty but doesn't believe she's pretty. She bleaches her dark hair blond to try to get the whole world to like her, Pinzon says. But despite herself, her beauty and all her potential are still there.